Your prayers are vital to our ability to reach the unreached with a message of hope. Thank you for praying. For the latest Prayer Partner or information about becoming a Prayer Partner, click here. The generosity of people like you enables us to share life-changing good news with people who need to hear it. We are funded almost entirely by supporter donations. To make your donation, click here for online giving, or here for other ways to give. We have an amazing opportunity to bring spiritual and social transformation to millions of lives around the world. In our Voice & Hands newsletter, we often have testimonies and stories from our listeners that we’d love to share with you. If you would like to receive this newsletter, click here. We are grateful when people stand with us in our unwavering commitment to reach the unreached in remote and rural communities. If you feel called to serve with us, take a look at our opportunities to serve or call us on 1300 653 853. 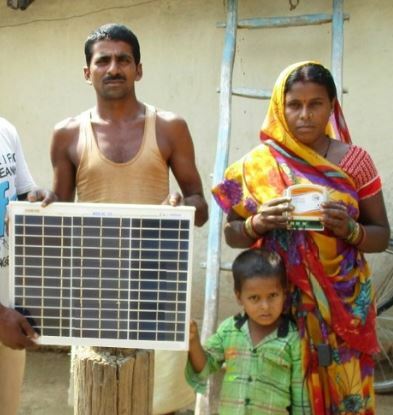 Light up a Village is an on-going project which provides solar panels, LED lights and shortwave radios to people in remote and rural villages throughout the Asia Pacific region, with a particular focus on India. The need is great. Over 700 million people in India alone do not have reliable access to electricity. They are forced to live in darkness. Can you image what it would be like to change the lives of every family in your street? You can do this for families by getting involved in ‘Light up a Village’. Your involvement and commitment to this cause will not only bring natural light to millions of people, but spiritual light too. It will reach unreached people groups and those who have limited access to the gospel with the life changing message of the gospel. We place a solar panel with multiple charging ports in each village, including LED lights and robust portable shortwave radios. The LED lights have a small battery like those in mobile phones. The villagers recharge their batteries during the day so they can use them at night. A 20 minute charge will provide light for up to 8 hours. By packaging a shortwave radio with a light we are able to give them two things – the message of hope, spiritual light, and the benefit of natural light. Effectively, an entire village is ‘lit up’ and can hear the message of Christ. Please help us to light up more villages. Your gift of $55 will provide a solar panel, LED light and shortwave radio for one family. Your gift of $550 will provide a village with a solar panel, 10 LED lights and 10 shortwave radios. With God’s help, and your valued support, we know that the light will shine brightly for a long time to come. He was willing to walk 160 kilometres! One boy heard how we are providing radios and was desperate for an opportunity to obtain a radio for his village in India. I had travelled to a small village. The pastor I met there looks after about 65 villages and cares and ministers to many families. He wanted us to come to an outreach he was organising – as his guests, “The people from Delhi who are on the radio”. We made sure that some of the listeners and some of the new people that came to the outreach would have a shortwave radio to take back to their village. Often remote areas lack a radio. We don’t actually sell them but ask a token 10 or 20 rupees, which is like a few cents, so that they would have ownership of it and value it. On the last day I was sitting down after the meetings watching the people go back home and this boy came to me and stood next to me for a long time. I asked him, “What do you want? Where are you from?” He said, “I wanted a radio”. I said, “There are radios over there, go and check”. He said in a sad voice, “There are no radios there, everything is gone”. I usually have one or two in my bag. There was one radio left. I said, “What do you have for this radio?” He replied, “I have 60 rupees (almost $1.20)”. I then asked him how he had come to this meeting and what had brought him here. He said, “I come from a village that is about 160 kilometres from here. Others were coming so I thought ‘let me come also and see what is happening'”. He had spent 60 rupees on the bus to come to this place and had 60 rupees to get back home. So he gave the 60 rupees and took the radio. I asked him, “How are you going to go back?” He said, “I am going to walk the 160 kilometres”. I was shocked! I returned the money and said, “Friend, here is your money, you go back by bus”. To allocate your gift, when you reach the review donation page, please leave us a message. To give by credit card over the phone, call us on 1300 653 853. Please ensure you clearly identify the transaction so it can be located in Reach Beyond’s bank statement. Please notify us of your contact details and the details of the deposit via our online contact form. Your receipt will be sent at the earliest opportunity. PO Box 291, Kilsyth, VIC 3137. By remembering Reach Beyond in your Will, you are helping to ensure that Reach Beyond is able to maintain its broadcasts to the vast number of people in the Asia Pacific region who have never heard the Good News of Christ. For more information please visit our Bequests page or download a Bequest Brochure below. your willingness to partner with us. If you have a heart to serve and are passionate about reaching those with little or no opportunity to hear the gospel, you may be interested in the opportunities we have available at our Melbourne Studios or our Kununurra Broadcast Facility. We currently have two positions advertised, please feel free to contact us if you are interested in exploring an opportunity to serve with Reach Beyond in Australia. Based at our broadcast facility in the beautiful Kimberley region of Western Australia, this unique and exciting ministry opportunity is ideally suited to a person seeking to be fulfilled in a ‘second-half’ career with a passion for kingdom impact and a sense of adventure. Reporting to the CEO, you will be responsible for managing our broadcast facility in Kununurra, which is a well-appointed remote town in one of Australia’s pristine environments. Ideally the applicant will have significant experience in managing people (staff and volunteers) including the ability to develop strategic partnerships and opportunities in the local community. Experience in project management would be an advantage but not essential. In short, the position has a strong emphasis on the value of relationship but can certainly be ‘hands on’ at times. This position will require the successful applicant to be the primary liaison between the Kununurra operations and the national office located at Kilsyth, Victoria. Reach Beyond is looking to fill this full-time position for a minimum of three years. As Reach Beyond is a not-for-profit ministry, we are looking for someone with a strong ministry call and a heart to serve. Ideally, the candidate will be self-funded or in a position to contribute to their own support. Subsidised housing and utilities are provided. Click here to listen to our audio advertisement or for more information, contact us or call toll free on 1300 653 853. Based at our broadcast facility in the beautiful Kimberley region of Western Australia, the Accommodation & Building Maintenance Coordinator position would ideally suit a married couple (although this position could be managed by an individual) who are seeking to be fulfilled in a ‘second-half’ career. The successful applicant will be responsible for managing and maintaining the accommodation facilities, including the accommodation block and caravan area, welcoming and assisting visitors and volunteers, and overseeing all aspects of visitor accommodation including associated administration. Basic handyman skills would be required. For more information, contact us or call toll free on 1300 653 853. You have a heart to serve but limited time – what can you do? You can volunteer in Melbourne, Kununurra or even overseas. Volunteers who partner with us expand our ability to stay on task – bringing a message of hope to the unreached. We appreciate every volunteer. We have a great mix of staff, missionaries and volunteers working part-time and full-time at the head office and studios. If you’re within commuting distance of Kilsyth, we currently have volunteer work in the following areas: technical, administrative, building maintenance and gardening. If you would like to explore how you can get involved, please contact us. Do you have a heart to serve in a mission environment? Many volunteers come and stay in Kununurra for short-term or long-term periods helping with farm work, trades, general handyman or technical work, gardening, painting, fencing, labouring of any sort, cleaning, driving, IT or administration work. If you’d like to explore how you can get involved, please contact us. Maybe you’ve been wondering about serving overseas. Reach Beyond offers both short-term and long-term mission opportunities outside of Australia. If God is calling you to use your gifts and skills to further the gospel in any of the countries in which we serve globally, then we would be happy to facilitate your inquiries in that direction. To explore this option, visit Reach Beyond’s current opportunities to serve page. After you’ve explored a bit, feel free to contact us. Reach Beyond in Australia is part of a global community committed to reaching unreached people groups with the gospel. Since 1931 when HCJB (now Reach Beyond) first broadcast the gospel message from Quito in Ecuador many millions of people have come to know Jesus Christ as their Lord and Saviour. Reach Beyond continues this vital ministry, broadcasting in shortwave to the Asia Pacific region from its Broadcast Facility in Kununurra, far north Western Australia. It is through the generosity of previous generations that the establishment and growth worldwide of Reach Beyond has been possible. As a result, Reach Beyond is a legacy from those individual men and women who named HCJB (now Reach Beyond) in their Will. We genuinely encourage you to consider your family first when drawing up your Will. We also suggest consulting a solicitor when preparing or altering your Will. for the general purposes of the Ministry.